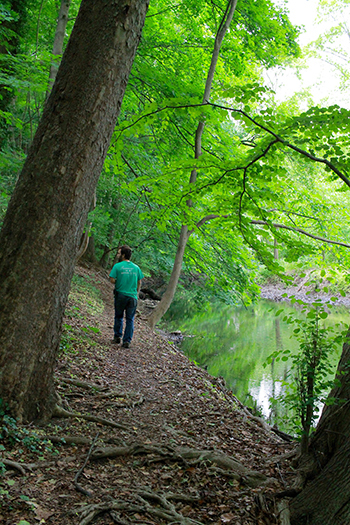 Of the over 200 acres in the Crum Woods, five unique locations are prominent for their excellent state of preservation: the Wister Forest, Martin Forest, Trillium Slope, Skunk-Cabbage Hollow, and the Southern Red Oak Forest. These sites have been subject to many of the pressures face by natural areas, such as invasive species competition, deer browsing, trash dumping, and trail use, but have remained excellent spaces with mature trees, beneficial and endangered species, and wildlife value. Through this series of articles, I will explore each space and share what I’ve learned about their special characteristics, plants, wildlife, and the struggles they face. I encourage you to visit each beautiful area yourself! Although, Trillium Slope looks most impressive in April when the trillium are in bloom, it is a quiet, peaceful, and fascinating location to visit at any time of the year. Trillium Slope is a steep area about three acres in size, located along the creek opposite the Holly Collection and meadow. It can be accessed from the Leiper-Smedley trail at the Crum Ruins. 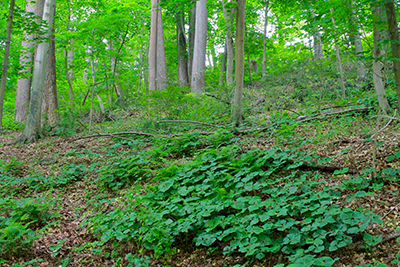 Although previously an oak-hickory forest, Trillium Slope is now known as a tulip-beech-maple forest. One of the many reasons American beech, tuliptree, and maple now dominate is because they need less sunlight to germinate. American Indians routinely burned the forests which allowed hickories and oaks to resprout and thrive with the increased sunlight. In recent years, forests in the northeast are rarely burned, and therefore shade tolerant species have taken over. Trillium Slope is known for its trillium of three different varieties: T. erectum, T. luteum, and T. grandiflorum. Although Mike Rolli, our former Crum Woods Restoration Assistant, suspects that most or all of these trillium were planted in the Crum Woods, T. erectum and T. grandiflorum are native to Pennsylvania, so could occur here naturally. T. luteum, however, is native to Michigan and southeastern states, stretching down as far south as Alabama, and as far west as Tennessee. 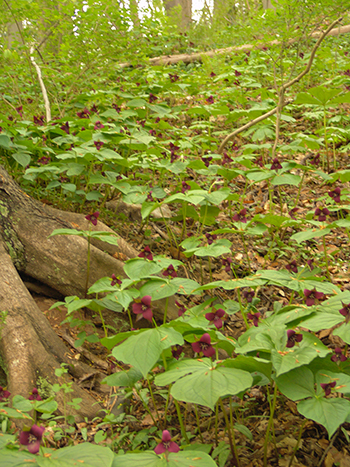 Much of the vegetation in and around the Oak Knoll ruins is a result of the Hinksons’ planting, so it is quite likely that they or a previous landowner planted the trillium. Evidence of the Hinksons’ gardens still stands including several Japanese tree lilacs, deutzia, pachysandra, and the remains of garden walls and other structures. For more information on the history and horticulture of Oak Knoll, check out this post. Several invasive plants plague trillium slope including Kalopanax septemlobus. Trillium Slope has a rich herbaceous layer composed of Virginia bluebells, Jack-in-the-pulpit, Mayapple, and trillium. Ten years ago, Trillium Slope also contained rare plants such as dwarf ginseng and goldenseal, but they have since disappeared. 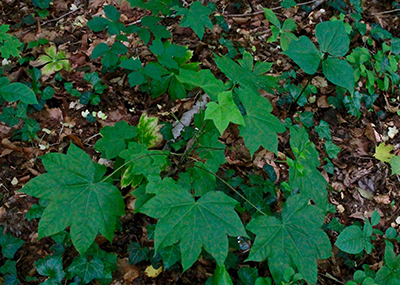 Several invasive plants plague trillium slope, such as Pachysandra terminalis (Japanese pachysandra), Kalopanax septemlobus (castor aralia), Hedera helix (English ivy), and Euonymus alatus (burning bush). 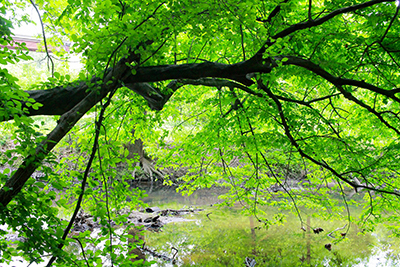 A large, twisted ironwood tree, Carpinus caroliniana, hangs over Crum Creek at the bottom of the slope. 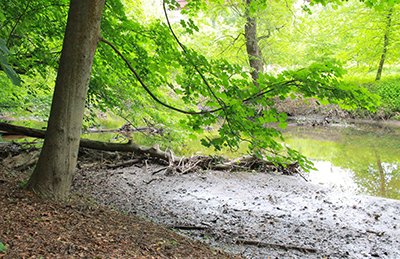 A mud flat with important plant and wildlife value is also located along the edge of the creek and stretches farther up and downstream. Occasionally, emergent aquatic vegetation can be found in this mudflat, an area in which plants are rooted in the creek bed but have leaves or flowers that are visible above the water. The mud flat is also sometimes used for turtle nesting. As we walked along the creek, we saw several large turtles sunning on a log. Trillium Slope is a lovely place to take a walk, in spring or any time of the year; a more tranquil spot in the Crum Woods would be hard to find. Be sure to visit the Southern Red Oak Forest while you are nearby.